The Sirius ~ Leo Cosmic Festival is celebrated at the Full Moon during the sign of Leo (July 22 - August 22). In 2018 the Full Moon is exact Friday, July 27 at 1:20pm PDT (20:20 UT). This Festival is dedicated to the task of making contact with Sirian force. 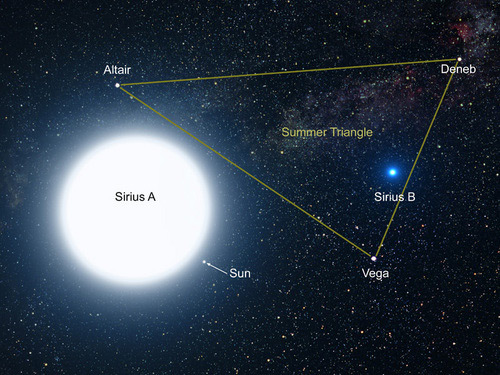 This picture is an artist's impression showing how the binary star system of Sirius A and its diminutive blue companion, Sirius B, might appear to an interstellar visitor. The large, bluish-white star Sirius A dominates the scene, while Sirius B is the small but very hot and blue white-dwarf star on the right. The two stars revolve around each other every 50 years. White dwarfs are the leftover remnants of stars similar to our Sun. The Sirius system, only 8.6 light-years from Earth, is the fifth closest stellar system known. Sirius B is faint because of its tiny size. Its diameter is only 7,500 miles (about 12 thousand kilometers), slightly smaller than the size of our Earth. It is said that all great Avatars and evolutionary energies originate from Sirius, the brightest star in our heavens. The influences of Sirius are focused through Regulus, the heart of the Lion, found in the constellation of Leo. According to the works of Alice Bailey, the Leo-Sirius connection is key to humanity's spiritual evolution and the building of a new unifying world religion. This Sirius ~ Leo Festival offers a great and unique opportunity to become aware of these cosmic energies. During the Sirius ~ Leo Cosmic Festival, the soul light within us is ever increasingly aware of the spiritual light emanating from Sirius. This great Sirian light is becoming more available, bringing to us a new opportunity, a new path. The Sirius ~ Leo Festival prepares humanity and in turn planet Earth for perfection and ultimate cosmic service, bringing us into contact with the Heart of God. Note: Once a year, during Earth's orbit around the Sun, the Sun passes directly in front of Leo's brightest star, Regulus. These heavnly bodies unite as one in a hearty solar / soulic embrace. This occurs because Regulus is positioned almost exactly on the ecliptic. Annually on or near August 22, the Sun (heart of our solar system) occults Regulus (heart star of Leo the Lion), which focuses and regulates the emanations of Sirius (esoterically the heart of our Sun) toward Earth. In 2018 the Sun occults Regulus August 22. Annually the Sirius ~ Leo Cosmic Festival Full Moon lies in the dim constellation Capricornus. High above flies Aquila the Eagle with its brightest star Altair, the head of Aquila. This star is also the southern point of the Summer Triangle, a transformational gateway seen overhead in the night sky during Leo. The constellation Capricornus opens the doorway to our divine head center and the immortal life of spirit. It carries the seeds of death for the material life and awakens one to a higher spiritual frequency and its potential earthly expression. Capricornus aligns humanity with a new cycle of effort, initiation and service. Aquila the Eagle, the royal eagle of Jupiter and the great bird of Zeus, is a messenger from heaven, who leads us to immortality by lifting us to the realms of higher mind and intuition. Aquila and its brightest star Altair soar above the Full Moon symbolizing vision and freedom. In flight Aquila is known to carry mighty thunderbolts in his talons. These can shake one to their core, if one resists the divine message. Listen! Co-create with the inner divine one! Hmmm ... It is curious that the eagle, a symbol of the United States, has this close relationship in the heavens with the Sirius ~ Leo Full Moon. May the U.S. be lifted out of divided darkness into the unifying realms of higher mind and guiding intuition. Note: Annually the Galactic New Year begins July 26, in the sign of Leo (July 22 - August 22). Originally this day correlated to the first visible, though brief, appearance of Sirius rising above the eastern horizon. This New Year is based on the 13 Moon Calendar. The Full Moon during Leo is illuminated by the Sun in the constellation Cancer. Cancer offers the opportunity of the "dark light" of matter to be stimulated by the light of the soul. Generally, eclipse lunar cycles mark a time of shifting into a new octave of experience ... to resynchronize our selves with the ever-changing cosmic currents supporting our evolutionary progression in consciousness. Eclipses tend to bring about endings [Full Moon/Lunar Eclipses] and new beginnings [New Moon/Solar Eclipses]. Eclipse influences generally last about six months, until the next eclipse occurs. Eclipse lunar cycles are ideal times to set new six-month goals to create personal change in our lives, not necessarily on the solar or lunar eclipse, but based upon the realizations we have throughout the eclipse lunar cycles. Lunar eclipses ... are about releasing the emotional bonds within ourselves that glue us to involvements that are less than we truly want or deserve. Heads up! It’s a month of eclipses. Partial solar eclipse July 13. Total lunar eclipse July 27. A small partial eclipse is visible from a patch of ocean between Australia and Antarctica. Just 34% of the Sun is covered for viewers closest to the center. Learn more at Hermit Eclipse. Also see EclipseWise. A solar eclipse is always a supercharged New Moon. The light of the Sun representing our masculine active, conscious will and vital life-giving force is joined by the darkness of the Moon representing our female receptive, subconscious, instinctive nature. A New Moon eclipse is a personal and global opportunity and challenge to come into a new balance and level of wholeness, one that can shift our self-perception and self-expression dramatically. Pluto retrograde (April 22-Sept. 30) is in a close approach to Earth. July 12, 2018 it is nearly in precise alignment with the Earth and our Sun. It is strongly affecting humanity at this time. In addition to the emotional nature of a lunar eclipse, it is worth pointing out that a lunar eclipse supercharges a Full Moon with the unknown, a void – darkness. It blocks the Moon's reflection of the Sun's light by the Earth and suggests that our material viewpoint stands in the way of our "seeing the light". We are reminded to reflect on how we are held in the dark by virtue of our perspective. A Total Lunar Eclipse occurs on July 27. The Full Moon conjoins retrograde Mars, both of which conjoin the head and foreleg of the Goat in early sidereal Capricorn. This planetary alignment marks the pivotal point in the Mars retrograde [6/26-8/27] and also initiates the new Mars 780-day synodic cycle[*]. Mars retrograde [6/26-8/27] is in a close approach to Earth now. The Red Planet is the biggest and brightest it has been in 15 years - since August 11, 2003, thus it is having a strong effect on humanity. An open heart and mind activates the soul and helps one make spirit contact with the Sirian force at this time, when both Pluto and Mars are in a close approach to Earth. Hmmm ... Curious about the July 12-Aug. 11, 2018 lunar cycle? Stepping Through the Veil ~ The Pluto Solar Eclipse & the Mars Total Lunar Eclipse gives Nick Fiorenza's insights. Note: Sirius reappears briefly in the morning sky August 8 for observers in San Francisco. BTW: In 2018 during the sign of Leo (July 22 - August 22) the August 11 New Moon's partial solar eclipse occurs just west of Regulus, the heart star of Leo the Lion, which focuses and regulates the emanations of Sirius Our Spiritual Sun toward Earth. Reminder: The Sun occults Regulus August 22, as discussed earlier on this page, in the "Note:" above the Eagle / Full Moon graphic. The seeds of death for the current material life are activated and we must awaken to a higher spiritual frequency and its potential earthly expression. Now is the time for the "dark light" of matter to be stimulated by a far greater light. The time has come to recognize we all are of divine lineage, evolving toward our greater destiny. We must lift ourselves to the higher ground of soul and its guiding intuition. It is here that we can receive the new awareness of the infinite unknown. With the light of the soul we see how to bring these new energies into our everyday lives. During this Full Moon Festival we make contact with the Sirian force, its evolutionary energies and the cosmic principle of Love and Freedom. In 2018 we are also moving through the two eclipse gateways of Leo's Full Moon lunar cycle and the one eclipse gateway in the sign of Leo! These gateways are initiatory opportunities that enable us to move toward the doorway of higher unified consciousness. It's like walking across a bridge to a brand new place, and there is no turning back. The heavens are pouring forth new life ... drink up! All who wish to join the Sirius ~ Leo Cosmic Festival Global Meditation are welcome. If you are unable to meditate at the exact time of the Mars Full Moon Total Lunar Eclipse - Friday, July 27, 2018 at 1:20pm PDT (20:20 UT) - choose a time within 12 hours before or after the exact Full Moon Eclipse to participate in this cosmic event. See Eclipse Frequency if you are interested in learning how often and when eclipses occur. Brings us closer to our home in space.